In our lives, they say that we will meet up to 80,000 people, however only a few will make a long-lasting positive impression on us. 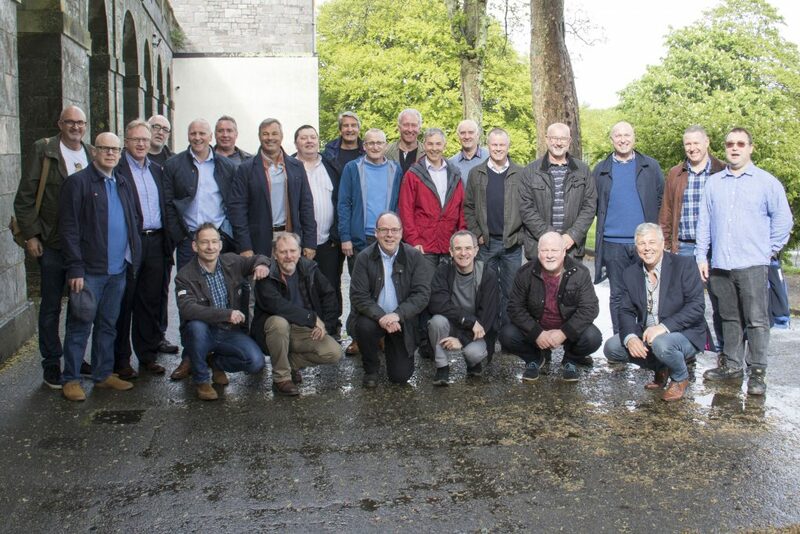 This is the story of how 7 years of going to the same senior school has had such an effect on a group of guys, some of whom had not seen each other for over 30 years, who decided to have a school reunion. No doubt, at some point in your life, you will be asked to attend a school reunion, and you may have difficulty deciding whether to attend our not. Perhaps, reading this will help you to decide whether the positives outweigh the negatives. 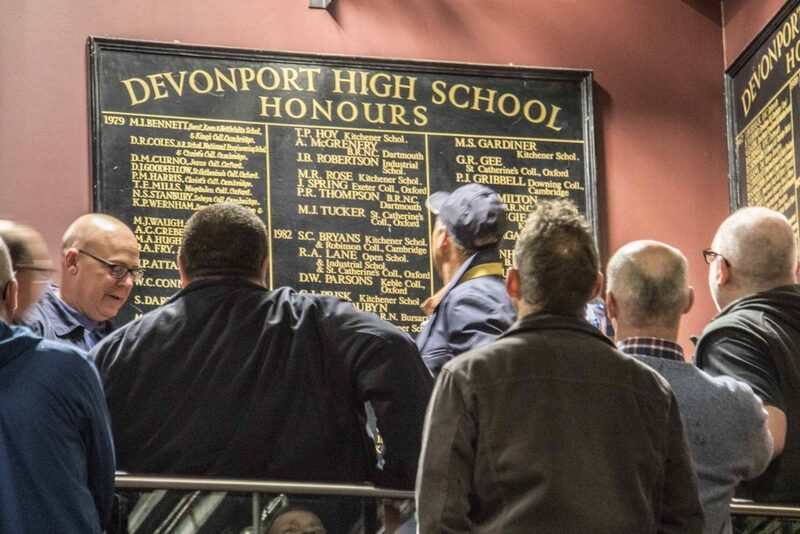 In May of 2017, a conversation on Facebook between a few old school friends, sparked a chain of events, akin to a chemical reaction in the Chemistry Laboratory of our old school, Devonport High School For Boys (DHS) in Plymouth and became the catalyst for a long overdue reunion. 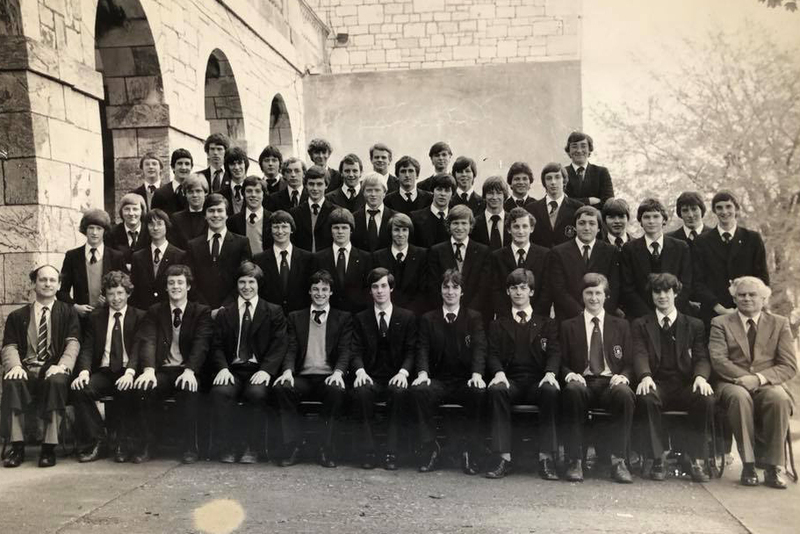 A Facebook group, “Tales From The Colonnade” was formed and through individual connections, lads from the Year Group Of 1974 joined. As each new member joined the group and was introduced, it brought back memories of form teachers performing the daily ritual of the register, Allen, Baker, Bartlett etc. etc. Technology that had not even been dreamt about when we put on our school caps as first year “Scruffs”, as we were affectionately called over 43 years ago, was put to good use. Using a combination of mobile phones, Google, LinkedIn, Twitter and other apps, our numbers swelled. Those who valued their social media privacy, where kept updated via email, whilst those in the Facebook group shared tales and photos, awakening memories of the past and forging relationships that, for some, had withered over the years. The halcyon days of our youth and time at DHS began to burn brightly once again. A date was set, for events, yet to be decided, to gather in Plymouth on Friday 11th and Saturday 12th May, 2018, sufficient time for diaries to be blocked out and travel arrangements made, especially for our most distant colleagues who, had committed to return from their homes and lives in Australia, California & New Zealand. 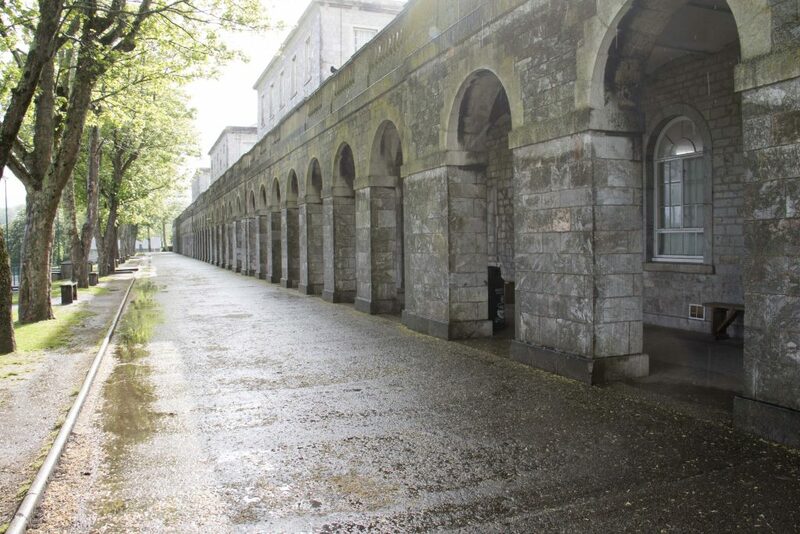 Our school was contacted to see if we could tread once again in the footsteps of our youth and walk under the arches of the colonnade, rather than completing the 100m sprint, as we did when our bodies were in their youthful prime. The response from the school was favourable. Post school tour drinks and a curry night was suggested to round off the plans for the Friday. The ideas for the Saturday were a round of golf, for those not suffering from the ravages of age, whilst others suggested a trip to The Plume Of Feathers, Princetown, where many a pint was sunk as we use to belt out folk songs performed by a group called Porrij. A final evening of drinking and storytelling was suggested as the finale, at a venue on the Barbican. As the date drew ever closer, banter, stories and photos a plenty reached a crescendo in the Facebook group. Those from far flung corners of the globe began their journeys, posting photos from various travel hubs around the world. In the days before the reunion, others began to travel the length and breadth of the UK, their destination, Paradise Road, Plymouth. It was reminiscent of a gathering of wizards from one of JK Rowling’s Harry Potter books. At 4pm, we gathered in the Conference Centre, to be met by Geoff Davis, Business Manager and Dan Roberts, the current Headmaster. Dan warmly welcomed us and gave us an overview of what had changed in the 30+ years since we had left. 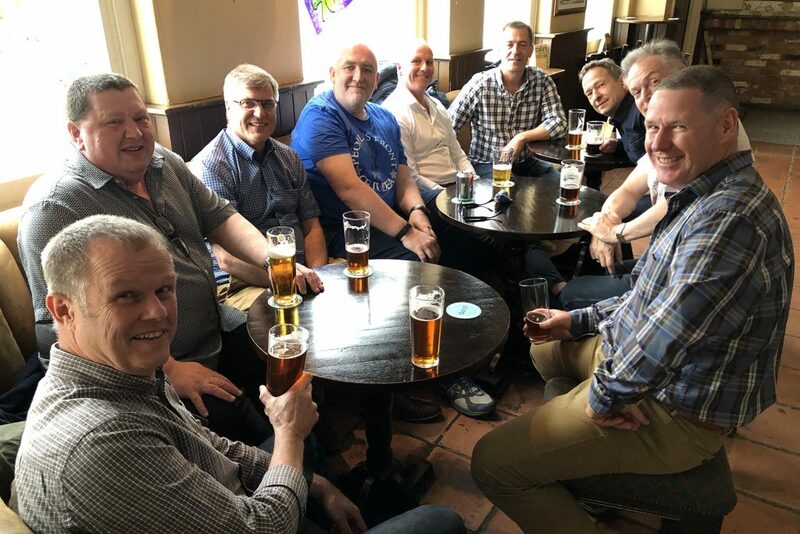 Some of our group, who will remain anonymous, had also managed to get in a sneaky pint in The Millbridge, a hostelry we frequented to study a range of different hops when we were 17, oops, I meant 18!! The tour started with us visiting the school blocks, that in our day, belonged to Tamar School, a totally alien world to us. The group made pleasant small talk however, it wasn’t until we reached the part of the school that we were taught in that our group became animated. “This was our turf”. Form rooms, where allegiances to North, South or West (our classroom names) were forged. Laboratories where we dissected all manner of things, or created highly dangerous chemical reactions, safeguarded only by a flimsy pair of glasses. The old library and staff room, each one evoked different memories and stories to be told. Then, the final part of the tour, starting with the old assembly hall, where accolades of academic and sporting prowess were announced and school plays and musical extravaganzas were performed. I’m sure “‘Tis of our school the high we sing”, the opening line of Prorsum Semper Honeste, the school song, could be heard, angelically sung by those who were sadly no longer with us. Then onto the changing rooms, the scene of more victories than defeats for our sporting heroes of yesteryear and where the sweat and mud of their toil was washed away in freezing cold showers, in a time when a School Frisbee Team was unheard of. We then moved onto to some of the newer buildings, the drama room, where a number of our group spotted their names on the Rolls of Honour that adorned the walls, their chests visibly expanding with pride to spot their name emblazoned in gold lettering. 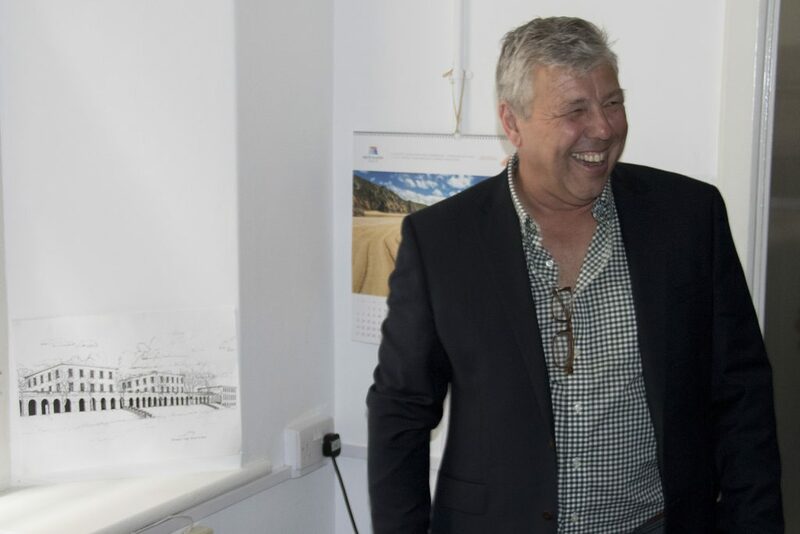 In one of the rooms, there was amazement, as there, on a window ledge was the pen and ink drawing that was created by one of our very own group, Mike Phare, back in the 70s. To conclude the tour, a final photograph next to the colonnade was taken, to re-enact those taken in a similar position over 40 years ago. With our warmest gratitude shown to Geoff Davis, our band of brothers departed for some well-deserved refreshments. Others, who due to travel or work commitments, were unable to attend the school tour, joined us for drinks at The Walrus, just a short walk to our chosen restaurant, Everest Spice, where, apart from four other diners, we took over the restaurant. We did feel a little sorry for those four diners, who were probably expecting to have a quiet chat over their meal! In between courses, which were superb, we were entertained by a playlist, put together by Dave May, which was drawn from a selection of songs that we each had classed as our favourites when we went to school. The vocals from artists such as The Jam, Madness, Genesis, Status Quo, Gary Numan, Motorhead, OMD, George Benson, played in the background and reflected the eclectic mix of music that we listened to in our youth and continued to do so now. 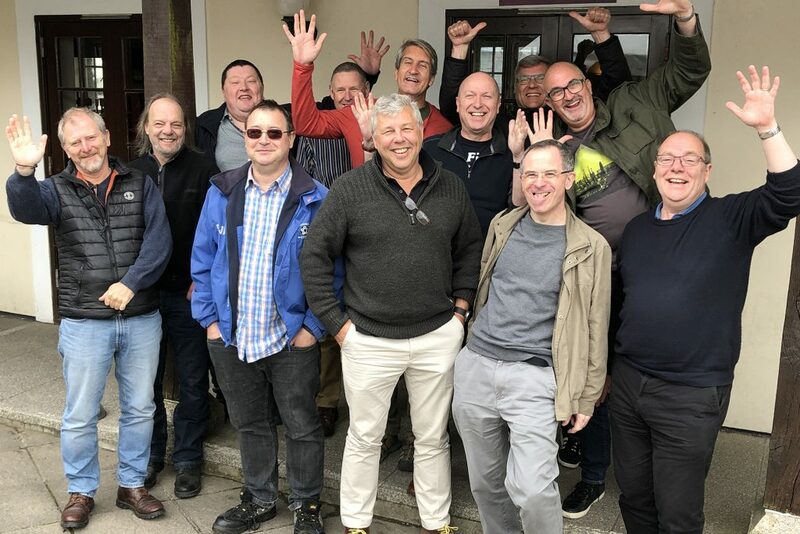 On the Saturday, some of the group decided to spoil a good walk, by playing a round of golf, whilst another group headed to The Plume Of Feathers, Princetown, where we used to go to listen to a folk band called Porrij. Pasties and Pints were the order of the day. John Pearce, one of our year group, who only found out about the reunion at the last minute, drove his motorbike for 3 hours from Wales, to join us for lunch and then, due to other commitments, drove 3 hours back!! On the Saturday evening, a private function room in a pub called Porters, in Looe Street, near The Barbican was the venue. The atmosphere in the room was incredible, with many stories being told, resulting in much laughter. One of the highlights was a surprise initiation for one of our group, Tim Hoy, to that of prefect, something that was overlooked in his school days, due to him being a “disruptive influence.” The proclamation was made by Mark Northcott, an honorary scroll presented and then the ceremony was concluded with Tim being adorned in a school blazer and prefects tie. A life-changing moment if ever there was one. 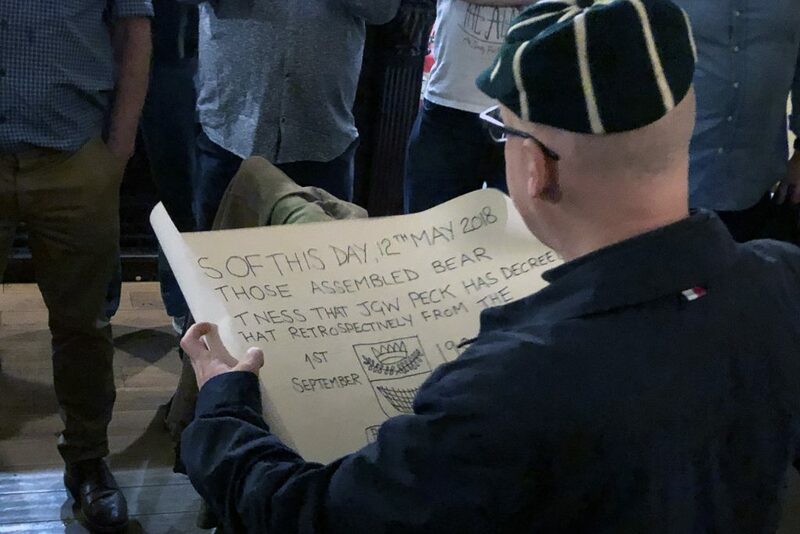 The end to an amazing couple of days of reunion was concluded by Dave Ware, leading the rest of those in attendance in a rousing chorus of the school song. As the night drew to a close, our farewells echoed around the room, accompanied by lots of hugging and back slapping. So was all the travel and expense worthwhile? Well, these are a selection of comments from those who attended. Great examples, to never underestimate the power of shared experiences and memories that bond individuals together. In conclusion, below is an ode that I put together to sum this up. In September of the year ‘74, 93 young men, new uniforms wore. Complete with caps, which were a must, they all had passed the 11+. Their chosen school Devonport High, the one with a silver and green striped tie. Academic success was the goal, with lots of sport to strengthen the soul. From schools across the Land Of Muff, their first year nickname was that of Scruff. Proud to be part of the school deemed best, they were split into North and South and West. Gilbert, Raleigh, Grenville, Drake, were the House Names they must also take. So the seeds of bonds were sown, and over time these have grown. Those bonds remain throughout the years, in times of joy and times of tears. Even though spread far and wide, school-day memories keep them tied. Teachers, nicknames, the japes, the jokes, the things we did, the stuff some smoked. The girls we had, the drinks we drank, the troubles caused by a gone wrong prank. Lower playground, Colonnade, Headmaster’s Room if you’d misbehaved. Upper playground, Sixth Form Hut, a former mortuary where we got our tuck. That hole in the fence by the rugby field, bully prefects that did not yield. Detention, homework, school dinners as well, chemistry, biology with that weird room smell. Freezing cold showers after PE, reversible shirts to play rugby. Jesus, Taffy, Rock and Bing, Miss Stone and Trev who helped us sing. Mr Moon, Nobby Clarke, Wilf Nash, athletics in Vicky Park. Good times, bad times, had by all, the lows and the highs when we had a ball. The music, TV, the parties we had, under-age drinking, it wasn’t all bad. Fiesta, Monroes, Cooperage, Clones, Abbey Hall Discos with Godly undertones. Barbies at Mount Edgecombe, School Busses, Motorbikes, training for Ten Tors with lots of Dartmoor hikes. Sports events you’d travel to by coach, or in a teacher’s car. Being next to Tamar, a totally different breed. No matter what your journeys been, your experiences and what you’ve seen. Whatever is your claim to fame, you’re one of few who’ve played the game. So raise a glass to those departed, who with us on our journey started. Prorsum Semper Honeste we roar, three cheers for the Year Group of 74.